The Business Advantage Travel Rewards World Mastercard currently has an Informr score of 8.2 out of 10. This score is based on our evaluation of 7 sources including reviews from users and the web's most trusted critics. Business Advantage Travel Rewards World Mastercard is typically available to those with excellent credit scores (650 or greater). The Bank of America® Business Advantage Travel Rewards World Mastercard® Credit Card offers business owners 1.5 reward points per dollar spent, as well as bonus points for travel booked through Bank of America's Travel Center. When you book your hotel through the Bank of America Travel Center – powered by Orbitz. When you book your travel (car & airline) through the Bank of America Travel Center – powered by Orbitz. When you're a Business Advantage Relationship Rewards client, you can get up to a 75% rewards bonus on every purchase you make. That means you can earn up to an unlimited 2.62 points on all purchases – everywhere, every time. Your rewards bonus is based on your enrolled tier — Gold 25%; Platinum 50%; or Platinum Honors 75%. Ideal for small business owners whose frequent travel belies tight budgets and Spartan tastes. The above-average earning rate on eligible travel purchases and lack of foreign transaction fees benefit frequent international travelers, but limited value-added perks and rewards program limitations alienate more discerning cardholders. 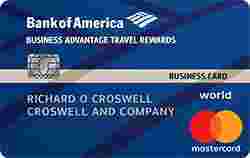 The Bank of America Business Advantage Travel Rewards World Mastercard credit card is an excellent travel card, offering a solid 3X points per dollar spent through the Bank of America Travel Center and a fair 1.5X points per dollar on all other purchases as well. However, what makes these point values even more impressive is the fact that this card has absolutely no annual fee. Despite not having an annual fee, the point system rivals those of luxury travel cards and other general rewards cards. If your business spends thousands of dollars on travel expenses and you don’t want to pay annual fees, then Business Advantage Travel Rewards World Mastercard credit card is a decent option to consider with its 1.5 points reward per every $1 spent and 3 points reward per every $1 spent through Bank of America Travel Center. If you want a rewarding travel card with business and travel perks, and you prefer not to pay for it, Bank of America® Business Advantage Travel Rewards World Mastercard® credit card is a smart choice. The Bank of America® Business Advantage Travel Rewards World Mastercard® credit card is a good option for businesses that travel often and want a $0 annual fee card with a competitive rewards rate. You’ll see an added bonus when booking travel via the Bank of America® Travel Center and can easily apply points earned to past or new travel purchases.